Retro Trend Vintage: Nine Days of Flea Market Finds and We Have a Winner! Nine Days of Flea Market Finds and We Have a Winner! Looks like a beautiful weekend is upon us - anyone feel like hitting a Flea Market? How about a nine day long virtual Flea Market hosted by Etsy's Vintage Market Team? Sound too good to be true? Well, it isn't. Each participating shop sets their own terms so do check shop announcements for details. All items ON SALE from 12:01 am EST on August 28th through 11:59 pm EST on September 5th! Items under $50 will receive $5.00 back. Items between $50- $100 will receive $10.00 back. Items over $100 will receive $15.00 back. Payment is due at time of purchase, through Paypal only. Discounts promptly made via Paypal. As always, combined shipping rates and discounts apply, including cross- site savings from retrotrend and RetroHommeVintage. Search vmteamflea for more items from Vintage Market Team sellers. Don't forget to check out our video by Antiques Galore Gal. And, a winner has been chosen for my FAN-Tastic Fans Giveaway! 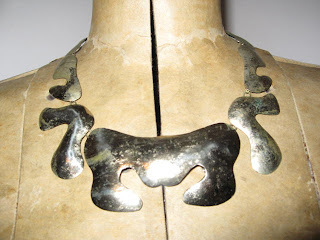 Zen Hen chose this amazing silvered tin Modernist link necklace by Luciano of Mexico. Great choice! Also, a special thanks to the lovely Weezi for featuring one of my dresses in her Friday Finds post. Guess I know where she'll be shopping this week. Always glad to bask in the glow of Weezi! Thank you, my dear.